"You can only work scientifically with a well documented collection". Geoscientific collections are archives comparable to libraries: you can only use them appropriately with the help of catalogs etc. 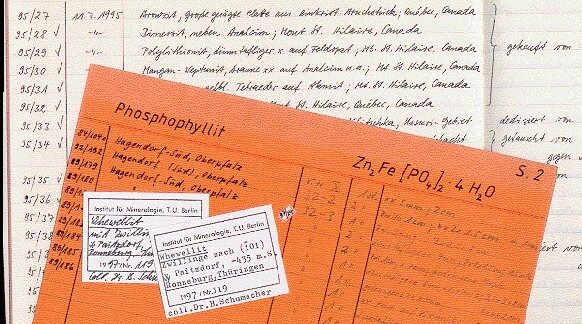 The documentation of the Mineralogical Collections of the Technical University of Berlin consists of inventory numbers, labels, inventory books, catalogs, scientific work and photography. inventory numbers Since the end of World War II inventory numbers read as follows: "year/piece number", i.e., a piece with the inv.no. 95/29 has been inventorized in the year 1995 as the 29th piece of that year. The inventory numbers, small paper signs of about half a cm, are sticked onto the pieces. Since 1988 they are embedded with two component synthetic raisin, for cleaning reasons. The inventory numbers are used uniformly throughout the whole documentation to be able to identify the pieces definitely. Older pieces have inventory numbers following several numbering systems. These numbers are maintained for science history reasons as well as to be able to assign single pieces to certain partial collections. labels Since the end of World War II printed form labels of the TU Berlin are used in the standard sizes of the keeping boxes. The labelling is generally done by typewriter, since 1988 by handwriting with China ink in addition, for reasons of maintaining the >200 years old style of the collections. All older labels are kept carefully to document the collection history of the piece in question. (Unfortunately, this has not been done carefully in the past). Unfortunately, no inventory books are still existing from the times before World War II, they were destroyed during the war. In addition, there are existing some catalogs for partial collections and partial themes of the collections, respectively. Unfortunately, there are existing no catalogs from the times before World War II, they were destroyed during the war. scientific research Supporting examination methods as x-ray methods, microscopy and several chemical analytical methods particularly serve mineral and phase determinations, supported by the laboratories and machine shops of the institute. The preparations usually are kept together with the pieces in the collection, or in special partial collections (for instance the collection of ore sections). They usally bear the same inventory numbers. photography Series of photographs of the vitrines and their exhibits serve documentation purposes as well as insurance matters. Diapositives of single pieces are kept in a special cabinet in alphabetical order of mineral names. Since 2006 specimens are photographed digitally, the old diapositives have been digitalized as well.